The lively theater scene at the community level has fed the growth of professional theater in North Carolina. The state was in the early 2000s home to more than 70 professional theater organizations. The theater industry generates in excess of $22 million annually and provides annual or seasonal employment to more than 6,500 people. Big-budget Broadway shows, featuring a combination of national stars and local casts, are staged regularly at theaters such as the North Carolina Theatre in Raleigh. Among the oldest professional theaters in the state, the Flat Rock Playhouse, established in the early 1940s, was designated as the State Theater of North Carolina by the 1961 General Assembly. Ranked one of the top ten summer theaters in the nation, it has also branched out into fall and winter holiday productions. Started by Robroy Farquhar, who moved to the North Carolina mountains from New York with his Vagabond Players, and now run by his son Robin, Flat Rock Playhouse remains a vital part of the North Carolina theater scene. North Carolina has two professional theater companies that are members of the League of Resident Theatres and work with Actors Equity contracts. Founded in 1976, Charlotte Repertory Theatre was originally called Actors Contemporary Ensemble. 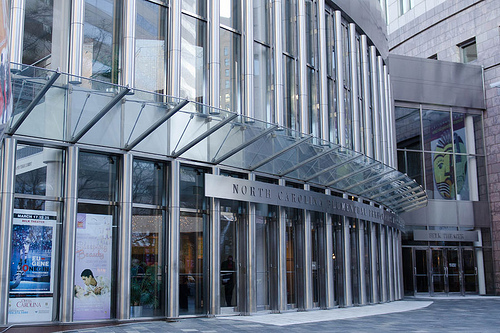 The resident theater of the city's Blumenthal Performing Arts Center, Charlotte Rep produces five plays each season, including new works, musicals, and world classics, and hosts an annual New Play Festival. PlayMakers Repertory Company in Chapel Hill, established as a professional theater in 1975, grew out of Koch's Carolina Playmakers. The company works closely with the University of North Carolina's Department of Dramatic Art and produces five plays each season in both classic and contemporary genres. Both companies have been recognized nationally for their outstanding efforts. The National Black Theater Festival is a biennial professional festival held in Winston-Salem since 1989. Founded by Larry Leon Hamlin in an effort to unite black theater companies and ensure their perpetuity, this event now draws international attention. Theater performances, celebrity appearances, workshops, and seminars bring more than 50,000 people to the city for six days of activities. The North Carolina Shakespeare Festival, founded in 1977 and based in High Point, was started by Mark Woods and Stuart Brooks and drew on the talent of the nearby North Carolina School of the Arts for actors and theater craftsmen. The festival is concentrated on a repertory season that usually consists of two Shakespeare plays and one other classical production. In addition to regular performances in the High Point Theater, the festival travels to Greensboro, Winston-Salem, and other cities. The company also tours performances and workshops to middle schools and high schools throughout North Carolina, with some trips into South Carolina and Virginia. The Charlotte Reperatory Theatre officially closed its doors on Feburary 20, 2005. The North Carolina Shakespeare Festival suspended operation in 2013, and after 37 years of productions the organization closed in 2014. Blumenthal Performing Arts Center in Charlotte, NC, 2012. Image courtesy of Broadway Tour. Courtesy of Broadway Tour http://broadwaytour.net/. Copy available from http://www.flickr.com/photos/broadwaytour/7043851891/ (accessed October 1, 2012).